Wargroove is a turn-based strategy inspired by Advance Wars and the Fire Emblem game series. It was developed by Chucklefish. The game is made of twelve story campaigns, in which we can play as one of a dozen or so heroes, each of them leading their own military units. 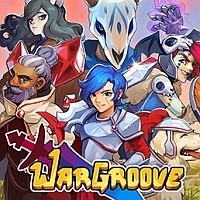 Wargroove for PC, XONE and SWITCH is a turn-based strategy with pixel-art visuals visibly inspired by games like Advance Wars or Fire Emblem. It was developed by Chucklefish, creators of the well-received game Starbound. Wargroove for PC, XONE and SWITCH is made of twelve story campaigns with a dozen or so playable characters who lead their own units. As we play, we move around a 2D map, gather resources, build an army, and fight with more and more enemies. Exploration, both on land and sea, play a crucial role in the game. In addition to the story campaigns, Wargroove offers a local and online multiplayer for up to four players. Wargroove comes with a level- and scenario editor. It allows the players to create their own campaigns. The tool allows, for example, to create a series of missions. Its intuitive design makes its usage even simpler and more enjoyable.